Home Page - Benfield Research, A Division of Gallagher Benefits Services, Inc.
Benfield, a part of the Gallagher Human Resources Compensation Consulting Practice, provides the intelligence, competitive benchmarking and guidance essential for success in the dynamic healthcare market. The research arm of Benfield is responsible for syndicated research, analysis, reporting, training, presentations and client support. Areas of focus include the marketplace influence of jumbo employers (5,000+ employees), non-jumbo employers (50-4,999 employees), leading employer health coalitions, employer advisors and integrated delivery networks (IDNs). 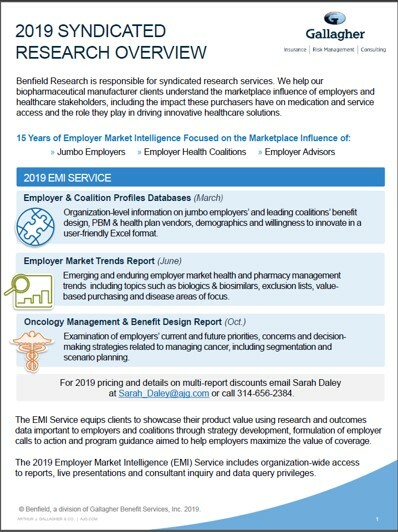 The EMI Service consists of syndicated reports focused on understanding the ever-evolving employer market opportunities for healthcare stakeholders, particularly biopharmaceutical manufacturers. The 2019 EMI Service includes print and online access to reports, live presentations and consultant inquiry and data query privileges. Click each report title for more information or contact Sarah Daley at 314-656-2384.